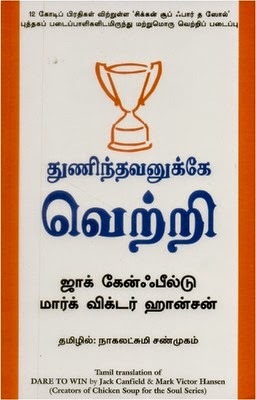 This is the Tamil version of the self-help book, Dare to Win, written by Jack Canfield and Mark Victor Hansen. In this book, the authors assert that if we develop self-esteem and confidence, and think like a winner, we can certainly be winners in reality. They discuss how to eliminate the hurdles that make our journey towards victory slower, and enhance our imagination. The book also tells how to focus all our energy towards achieving prosperity and awakening our spiritual self. It helps in realizing the wonderful opportunities that life has to offer, and all that a person needs to do is only dare to win. Jack Canfield is an American author, educator, trainer and motivational speaker. He is the co-creator of the popular Chicken Soup for the Soul brand and holds the Guinness Book World Record for having seven books simultaneously on the New York Times bestseller list. He completed his B.A. in Chinese History from Harvard University. He then attended the Master of Arts in Teaching Program at the University of Chicago, which required for him to teach in an inner city high school. Canfield went on to complete his M.Ed. in Psychological Education from the University of Massachusetts Amherst in 1973. Mark Victor Hansen is the co-founder of the Chicken Soup for the Soul brand, along with Jack Canfield. He is a popular speaker, author and marketing expert. Mark’s powerful messages of possibility, opportunity and action have brought great changes in business firms and in the lives of individuals across the world.